A Hotpoint oven door lifts off of its hinges, which fit into the bottom of the door. Since there are no other connecting pieces, the way to adjust the door is to lift it off the hinges. Adjustments are most likely necessary when the door won't open or close properly. Try removing the door and installing it to fix the problem. Otherwise, you may need to replace the hinges if reinstalling the door does not take care of the problem. Position one person on each side of the oven door. Open the door to the stop position. Grip each side of the door. Pull the door off the hinges. Pull the hinges out to the stop position. Hold the door upright. Center the slots in the door over the hinges. Push the door onto the hinges. Open and close the door fully to ensure that it moves smoothly and is properly installed. 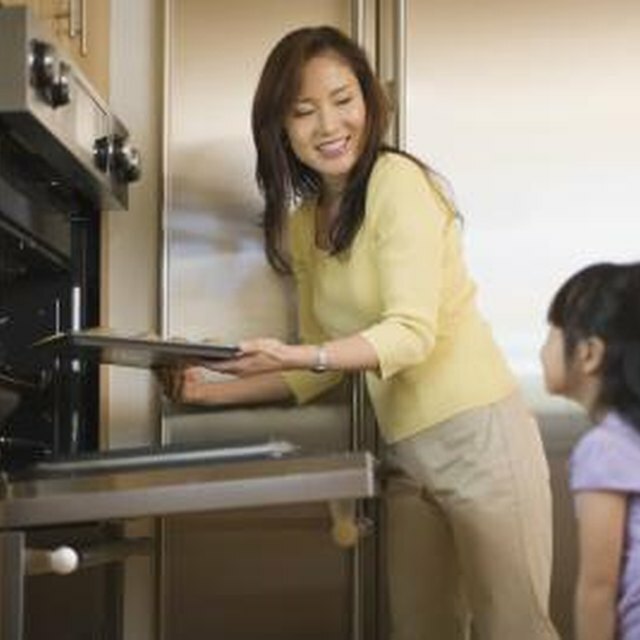 The oven door is heavy and requires two people for removal and installation. Do not place your fingers between the door and the hinges, which can snap back and pinch your fingers.